This is the topic for discussion on Mariovania. I was streaming some of this game this morning. It's a fantastic game from what I've seen. :) Definitely looking forward to streaming it some more with a better audience. Is it possible to watch a record of this stream? There is a recording on my Hitbox account, so theoretically yes. But Hitbox isn't letting me save the recording... (the "Save" button is grayed out). I don't understand why. I suppose I should mention the bug I found in my first stream: when you hit the switch to remove the barrier to the first warp zone, it stays solid until you leave the room and come back. Anyways, I've watched your stream on YouTube. The video quality is terrible, but I suppose that's not your fault. That visual glitch in Pipeline, is it how it appeared in your game, or it's some recording problem? (09-28-2016 10:43 AM)KoBeWi Wrote: The video quality is terrible, but I suppose that's not your fault. It is my fault, actually. I have the video bitrate set rather low (500). I guess I could raise it. EDIT: Actually, it's because I use a low resolution, come to think of it. Quote: That visual glitch in Pipeline, is it how it appeared in your game, or it's some recording problem? It was objects disappearing, right? That's something to do with how OBS records (probably related to OpenGL; I've had this same thing happen before with Naev). It doesn't show up that way to me in real life. Black heads with candles? What I see is data/gfx/objects/destr27-3, I think (though they're positioned in such a way that parts of them on the bottom are hidden). What file should I be seeing? Also in Entrance, next to Waterway pipe, you've seen destr16, but should be destr1. These are some very weird bugs. xD It looks like the images are adding random numbers. Why I was able to use the cape power early, on the other hand, completely stumps me. EDIT: Here's a thought: I'm not entirely sure, but it looks like the method of choosing the appropriate image (objects.rb, line 595) just chooses the first one found by Ruby that matches a pattern. I'd bet that the ordering of these images is different on Windows than on Ubuntu for one reason or another, and so we end up with different images. If I've interpreted this right, the solution is to use a method that's less permissive about what image gets chosen (check for an exact file name, in other words). The new version is uploading right now. It fixes this and some other things (like making the "falling crate room" easier). Watching someone else play the game really gives idea what could be tweaked. Ok, I fixed the destructible issue too. It had this problem that I couldn't match the exact name, because the name saved in editor weren't the actual name. Destructible objects have varying number of frames and it's resolved by reading the file name (which has number of frames after the - ). I can't seem to find the stream with your battle with 3rd boss though. Also, is it just me, or you never tried to use the "Enemies" menu? Looks like it's the most active booth topic this year. Quote: I can't seem to find the stream with your battle with 3rd boss though. Hm, maybe the other stream I did on Hitbox has it? (10-01-2016 04:47 PM)KoBeWi Wrote: Also, is it just me, or you never tried to use the "Enemies" menu? It's not just you, I didn't even notice there was an "Enemies" menu. I'll check it next time. (10-01-2016 04:57 PM)onpon4 Wrote: Hm, maybe the other stream I did on Hitbox has it? (10-01-2016 04:57 PM)onpon4 Wrote: It's not just you, I didn't even notice there was an "Enemies" menu. 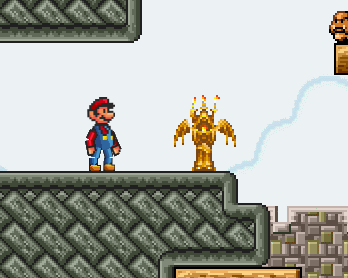 Like, you didn't hit the magic guide, didn't use second accessory slot until later in game, totally missed the effects of Clever and Holy pants (which are useful), and didn't get any Blue Mushroom. Also, I'm not sure if you know about Treasure Cards, even if you used one. But seeing how you keep trying to defeat bosses or pass the harder areas... that's respectable. Watching you struggle with Kamek, made me think that I should nerf him. I did it already before release and I didn't want to do it further, to avoid him being useless. But balancing him around players that presumably should have cleared few distorted areas is not a good idea too, as these areas are optional and only there to get the good ending. Anyways, I made his attacks less frequent and have less damage. His physical damage was nerfed a lot, and also he is less harmless to touch outside his charge attack. The lava column got a visual indicator to make it easier to avoid and the arena is adjusted to make it easier to not fall into lava. Maybe that's enough. You seem to avoid using tail. Well, Up+Jump activation may not be the best, but it made it like this, because otherwise double/triple jumps were harder to perform (if you tried to do these, the tail would slow you down). But interesting thing about the tail is that it can cause continuous stomping damage, if you jump on enemy and continue using it. It's good against Kamek, when he is immobile during lava attack. I see stats are confusing. I removed the useless jump guide and replaced it with stat guide. It explains what each stat does. The Most Precious Ring is actually an expensive junk you are supposed to sell for easy money. It's similar to Joyeuse from Castlevania. /The Ring/'s counterpart is actually A Ring, and I adjusted the former's description to make it more obvious. I like the theory that Triforce Set transforms you into Link, but sadly, it's just an set :( Wearing it whole just increases stats by significant amount. Also, there's a very useful item in lower Bowser's Hall, past the room where you have to jump on Podoboos (it was actually intended to be required to pass the falling crate room, but it was a bad idea, so the crates were nerfed in last patch, sadly too late for you). That item can be accessed as soon as you get Spin Jump, but it's quite hard to perform. btw, Spin Jump does 50% more damage. The Mirror is actually useful, but... well, it was bugged. When you stomp on enemy, you get a very brief invincibility, so you don't take damage even if you "land inside enemy" or something. It was happening, so I added that, and broken the mirror in result. Stomping was overriding mirror, normally it should make you invincible for 5 seconds. Mirror is also extra useful with Star Talizman or another star-related item you don't have yet. Also, you keep your weapon slot empty anyways, so it's not like you need the stars. About that room with spikes and water and lava... You aren't supposed to pass it with P-Wing and it's even designed to prevent that.You need another relic you already have. I made a cool thing, that makes no sense, but it makes it much more obvious what to do, because previously you'd have to re-enter the room if you did it wrong. The patch also fixes wand, so it doesn't home to dead enemies anymore. I nerfed Bowser and made his hammer attack predictable. Use the link above to get patch.